Delta Apologizes To Family That Was Kicked Off A Plane Over A Toddler's Seat : The Two-Way The airline is offering compensation and an apology to Brian Schear after a crew member said agents would put the parents in jail and place their children in foster care for a "federal offense." Delta is the latest airline to face fallout from an on-plane dispute, after a family that was forced off an overnight flight from Maui to California posted video that saw the crew say agents would put the parents in jail and place their children in foster care. The airline is offering compensation and an apology to Brian Schear and his family after Schear posted the eight-minute video on YouTube Wednesday. In it, Schear and crew members argue over whether the seat he bought for his 18-year-old son could instead be used by his 2-year-old. The airline wanted to put another passenger in the seat. "I'm not trying to cause a problem," Schear is heard saying on the plane as it sat on the tarmac in late April. "I believe in standing up for what's right, and I paid for the seat." The video was posted days after United Airlines reached a settlement with a man who was dragged off an overbooked plane in April, an incident that prompted outrage and congressional hearings. "We are sorry for the unfortunate experience our customers had with Delta, and we've reached out to them to refund their travel and provide additional compensation. Delta's goal is to always work with customers in an attempt to find solutions to their travel issues. That did not happen in this case and we apologize." 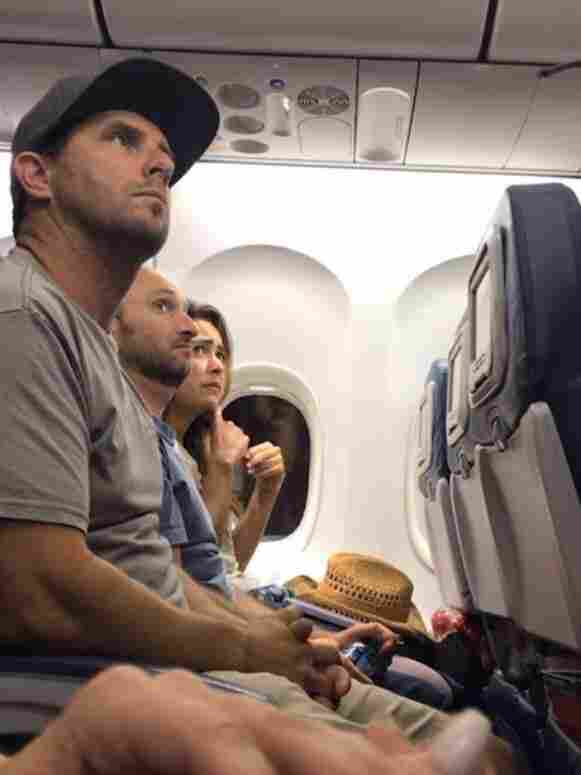 Early in the Maui video, Schear is seen being told that if he doesn't abide by the crew's order to give up a seat occupied by his toddler (in a car seat), he and his family would be kicked off the plane. With armed security personnel standing in the aisle of the plane, Schear says the airline would need to remove them. "Then it's going to be a federal offense," a crew member tells him. "I mean, you and your wife will be in jail and your kids will be put in foster care." Brian Schear, seen here during an argument with Delta staff, says he and his family were forced off a flight from Maui because they put their 2-year-old in a seat Schear had bought for a different child. "Wait," Schear says. "So we're gonna be in jail, and my kids are gonna be what?" "It's a federal offense if you don't abide ..." the crew member answers — as Schear cuts her off to say, "I bought that seat." In his posting of the video that was filmed by his wife, Brittany, Schear wrote, "The end result was we were all kicked off the flight. They then filled our four seats with four customers that had tickets but no seats. They oversold the flight. When will this all stop?" The incident has brought up several questions about aviation rules, from Delta's widely shared airline policy that children who are at least 2 years old must have their own paid seats to the Federal Aviation Administration's recommendation of car seats for kids who weigh between 22 and 44 pounds — a range that includes most 2-year-olds. It also touched on the requirement that a person occupying a seat on a plane must be named on the ticket for it. But clarity was hard to find on the tarmac where Flight 2222 sat in Maui late on the night of April 23, and the two sides could not find a compromise. "According to the rules we're pulling up right now, he technically cannot be in a car seat," a crew member says of the 2-year-old, apparently referring to the child having an "infant in arms" ticket. "It's out of my hands now," the airline employee later tells Schear. "I'm just letting you know from this point on, this plane will not go anywhere until you guys choose to go. Now, you can just sit here, and we can all just chill here. I'm just trying to help you, this is all I can do." "Trying to help us," Schear answers, "would've been not overselling the flight, and not trying to force us to get him out of that seat that I paid for, and holding this whole plane up." He then describes how he and his family had gotten onto the plane after passing through multiple checkpoints in the airport and at the gate, where the airline could have stopped them before they took their seats and set up their two toddlers in car seats. Later in the recording, Schear offers to hold the child in his lap for the flight, and is rejected. Instead, he's told, the only options that remain are for either the family to get off the plane or have everyone on the flight leave the plane. "What are we supposed to do when we get off this plane?" Schear asks in the video. "That's not up to me," replies a crew member, who later adds, "At this point, you guys are on your own." In the end, the family stayed in a hotel for the night, and got on another flight the next day. "Unbelievable. You guys are unbelievable," Schear says near the end of the video. "Great customer service. Awesome. Great job." After flashing a thumbs-up, Schear then rises, saying, "We need someone to help with our car seats, to carry them off." "How'd you guys get on the aircraft?" the crew member asks, in a question that speaks volumes.